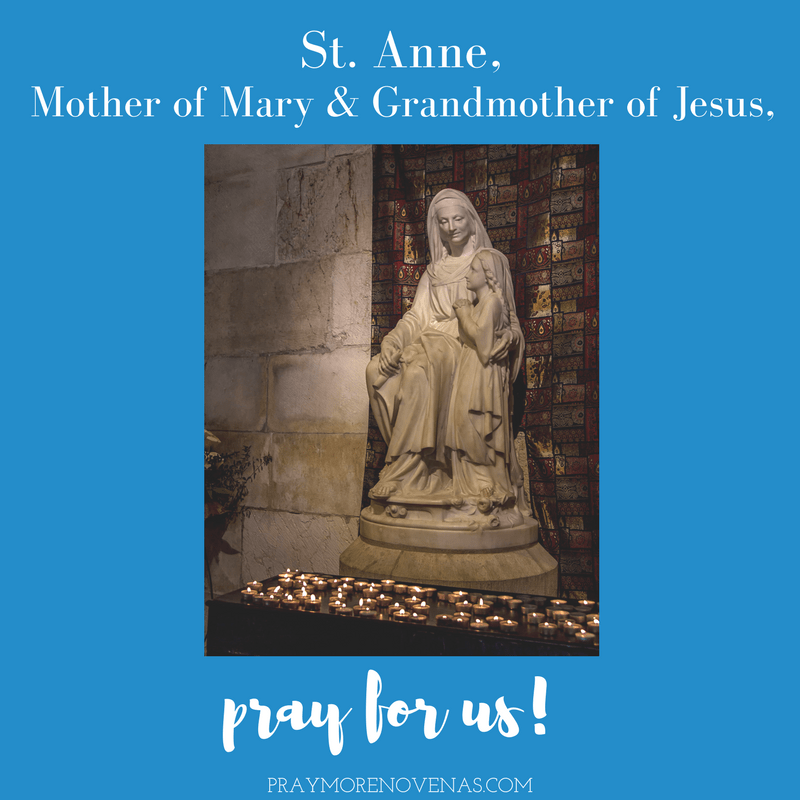 Here’s Day 6 of The St. Anne Novena! Praying for Cheryl, the daughter of Joanne; Cheryl is very sick and her mom is begging for prayers. Help my husband to enjoy life more and ease his loneliness. Help me to be more patient with him. In the name of the father.Amen. Thank you for hearing our prayers and our Concerns. Help me personally with my language. I have struggled with my foul mouth forever . Does anyone know whom the Saint that could help me.. Please also pray for a cure for Alzheimer’s disease. I hear we are very close to a cure. Nearly two years ago I prayed to St. Anne for her intercession for a friend who was a breast cancer survivor and wanted to have children, her little girl is a beautiful healthy one year old. A month ago I told this testimony to the mother of another survivor who wants to get pregnant, and I prayed to St.Anne in her intention, tonight she wrote to me she is going to be a grandmother! Thank you beloved St. Anne, you have intercede and Christ Our Lord has granted these miracles! Now I pray my son A will find a good catholic girl who will help him return to our faith and that he may remain working in S and become a citizen. Glory be to Jesús. St. Anne, please strengthen our country. We are losing friends and family members over Stupid politics. Nobody gets together,.families are arguing more and more. Help these parent and return them along with their children back to the church. Help my brother Joey whom suffers from Alcoholism. He is only in his 50’s. Please help us regain our love back for each other and for the love of Christ. We ask for your intercession St. Anne. St. Anne please fill my middle daughters lonilness with a Godly good Husband soon. Help her also to pass her teacher state exam. Bring also a Godly husband to my younger daughter too and help her to figure out her career. Thank you for answering my prayers. Please Saint Anne ….Help me with the situacion with J H …let us talk in friendly terms and come to the best solution. For Catherine I ask that she stays here and that her brother will not pressure her . Catherine …Matha B …Jorge …Mayte and increase of faith for all my flia. and will always remain faithfully to you and to your daughter and Our Lord Jesus Christ. St. Anne, please pray for me, St Anne, Bless me, so that my finances my increase and we can get a house to call Home. Dear St. Ann, I am unemployed due to a business decision and am anxious about finding a job that will be fulfilling spiritually and financially. Please guide me to the right job/career. Amen. Lord I pray for money to finance my son throughout medical school and to meet his other needs. I pray for money to pay for his tuition fees which is now due. Pray for my nephew and his new wife to have a long happy and healthy marriage making right decisions and being led to the right path and the return to the Catholic Faith/Church. Pray their future children will be born healthy normal, safe, with a safe and uneventful pregnancy and delivery. Pray for the families and all the people who have lost their lives in the Duck Boat accident in Missouri. Pray for 104 year old Gee, to be peace and calm and for a peaceful death without struggle or fear. Pray my husband and I will be on the same page while remodeling our with minimal stress and arguments.